Kerry Minor Team has 8 Players on the inaugural Electric Ireland GAA Minor Stars Football Team of the Year announced today. The Electric Ireland Minor Star Football Team of the Year will be formally recognised at the inaugural GAA Minor Star Awards that will take place in Croke Park on October 7th. The Electric Ireland GAA Minor Star Football Team of the Year features players from Kerry, Derry, Dublin and Cavan, the four semi-finalists from this year’s Championship. 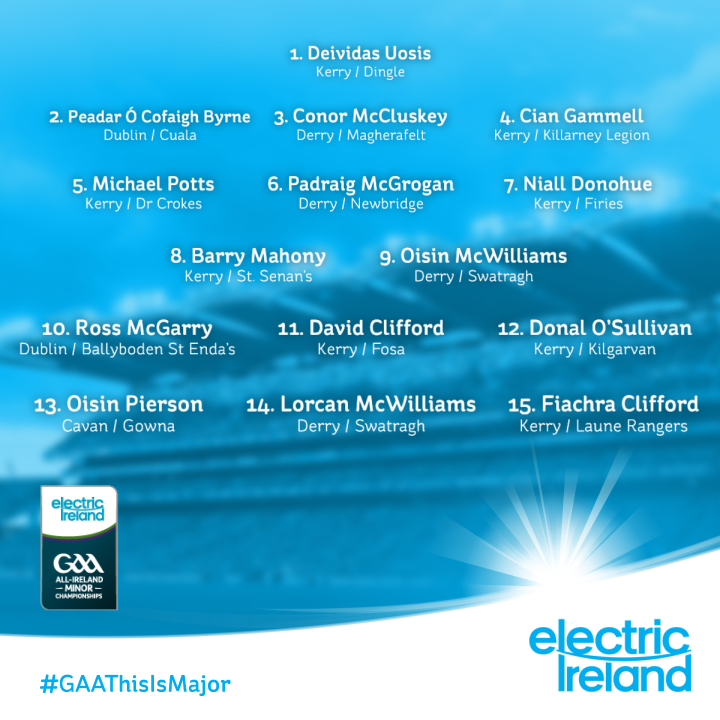 The team was selected by a panel of GAA greats from nominees that included the Electric Ireland Man of the Match and Player of the Week winners throughout the season. The four-man awards selection panel which was unveiled back in March, consisted of Meath Senior football manager Andy McEntee, legendary former Cork hurler and current Clare hurling selector, Dónal Óg Cusack; former Armagh All Star footballer, Oisín McConville and former Galway hurler and AIB All Ireland Club hurling championship winning manager, Mattie Kenny. The inaugural awards emphasise that there is ‘nothing minor about playing Minor’ and so honour the best individual performers from the entire season, also recognising the crucial and admirable part played by the families, clubs and communities of players which allowed them to get to this point in their sporting career.